Lapu Lapu Viñas Arnis and associated names having “Lapu Lapu” was originally a club which was an organization founded by the late Grandmaster Jose “Joe” Lamayo Viñas in the early 1960s. The usage of Lapu Lapu was never intended to be the name of the family system, but rather a marketing tool used to promote the club. Since the conception of the original club in the early 1960s there have been multiple organizations also having some variation of the the club name with propagators having their own understanding with pieces of the Viñas system; which was learned through one of the clubs. Due to the club name, misrepresentation in images, articles, and documents there has been some historical confusion about the founding date of the family system, its name, and the founding date of the original club and the club name. The original Lapu Lapu Viñas Arnis club was founded in Bacolod City Negros Occidental around the year 1963*. 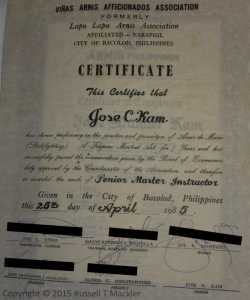 It was founded by Grandmaster Jose “Joe” Lamayo Viñas with 3 other initial members and two follow on members. These three other individuals included the late Grandmaster Dominador “Doming” D. Ferrer, Master Jose (Joe) Kam, and the late Master Santiago (Saging) Tolentino. Approximately a year later Grandmaster Eliseo Constantino and the late Master Rodrigo (Digoy) Guanzon joined as well. Out of respect for these individuals their current known title is referenced, but this should not be confused with their title at the time of the clubs conception. Each of these individuals were not ranked within the club during the clubs conception even with them having their own experience in different martial arts systems. Over time they all earned a title of Master within the organization. Individuals with Grandmaster status were given this by other FMA practitioners over time and not by the original organization. Their recognition of accomplishment of Master was accredited under the club name. 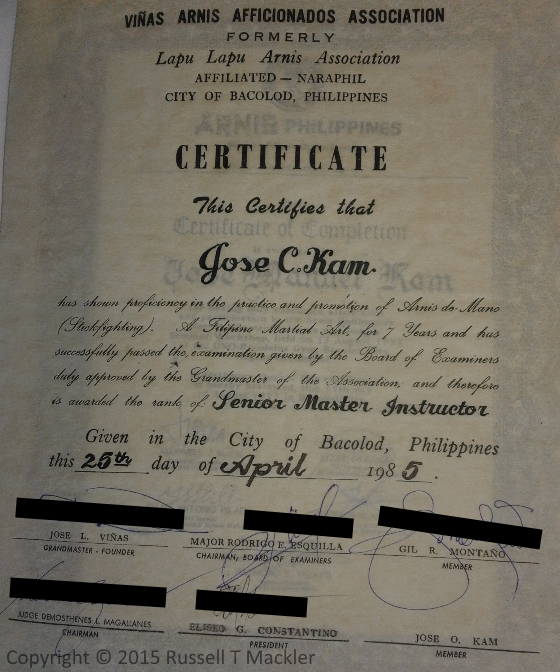 The image below is a certificate acknowledging Joe Kam as a Senior Master Instructor. The signatures have been censored on purpose. An important historical note within this certificate shows one of the many name changes with the club. Specifically the certificate says the new Club name as of 1985 being “Viñas Arnis Afficionados Association” from the previous name of “Lapu Lapu Arnis Association”. Historically it is important to note that there has been many club/organization name changes, but the family system has always been associated with the last name “Viñas”. (*) Information on this page has been collected and summarized through research. This has included documentation and recorded interviews with either Viñas family members, close friends of the family, or original members of the Lapu Lapu Viñas Arnis Club. It is important to note that additional research is taking place with an attempt to be as accurate as possible with the system’s history and associations through different clubs and/or organizations. Some information might be updated as new facts are presented. There is a lot of information around the history of the system and the club, and currently this information is being summarized on this website.